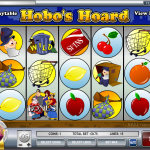 Hobo’s Hoard is a Rival powered video slot with as the name suggests a hobo theme. This is a big change from the more common Egyptian or Vegas style themes so it does give the game a good point of difference. Of course a strange theme is not everything you need for a great game. Luckily the folks at Rival have added two bonus games to Hobo’s Hoard which increases it’s score. You have both a free spin bonus and a pick a box style second screen stage. Top jackpot on the base game is 7,500 coins and top pay on the free spins is 22,500 coins (37,500 & 112,500 at max bet). The main symbols are largely of the traditional variety and include cherries, lemons, apples, oranges and pineapples as well as some theme-related ones such as a shopping basket, a bag on a stick, a cardboard box and the hobo himself. Bonus symbols include a dustbin wild and two scatters – a Coke can and a group of people – which activate separate features. The drinks can scatter symbols which triggers the spins is definitely designed to look like a Coke can without actually saying so but it’s a good bit of advertising for that particular drinks company. Anyway, three, four of five of these anywhere on view will win ten free spins and any prizes you win here will be subject to a 3x multiplier. Three more scatter symbols will also re-trigger the round for you. bonus – This brief mini-game is kicked off by landing three or more of the group of people scatter symbol anywhere in view. There’s not much to it really – you will now be taken to screen displaying five people and all you have to do is pick one to reveal a random prize amount. 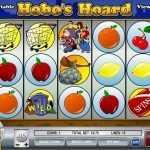 Hobo’s Hoard follows the standard of most Rival Gaming slots but it lacks a bit in terms of graphics quality. The Hobo’s Hoard feature is also a little disappointing and there are better Rival games than this available. Hobo’s hoard is another Rival gaming slot full of imagination and based on an original theme. 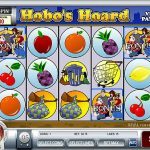 It is hard not to feel a little sympathy for the Hobos out there, but it’s a whole lot more fun cashing-in on their way of life in this slot version – and Hobo’s Hoard is bound to find a home in plenty of slot-play portfolios!